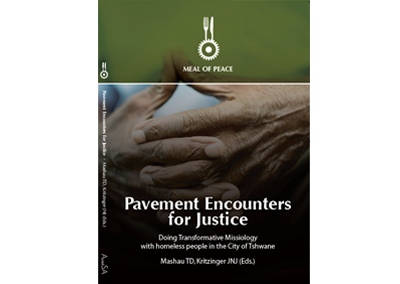 “Doing Transformative Missiology with homeless people in the City of Tswane” is the first book in a series entitled “Meal of Peace Series”. It has been written within the context of homelessness and challenges it brings in the City of Tswane. The authjors of the contributions to this book have done this with admirable commitment and sensitivity. To express their connectedness to the lives of inner city homeless people, they opted for the term “pavement” (instead of “grassroots”) to describe the nature (and the space) of these encounters. This is to underline the fundamental role that the concrete inner city context played in the theological reflections contained in this book. They are not suggesting that there is no grass (or parks) in the inner city of Tshwane, but to highlight the “hard” realities that inner city people face on the pavements of this city. It is also to signal that the kind of missiology done in this publication is concrete: it views the bricks and mortar used in the buildings and side-walks of the city as familiar terrain, a place where the Bible and theology are at home. The chapters in this book address a few specific “hard realities” that are playing themselves out on the pavements and in the buildings of Tswane, attempting to develop concrete responses to those challenges by mobilizing the resouces of the Christian tradition to embody the good news of God’s love, justice and compassion. Designed by The Agency | All Rights Reserved.